Fréquence d'utilisation : 2,4 GHz. Impédance entrée audio : 2 V p-p@600 Ohms. Niveau de sortie : 1 V p-p@ 75 Ohms (vidéo) 3 V p-p (audio). Fréquence RCU : 433,92 MHz (BZT, FCC). Niveau de sortie : 90 dBµV/mètre à 3 m.
Allows you to receive signals wherever you are in the house. Transmission distance: Up to 400m/ 437yd. 8-group 2.4GHz Channels- This wireless av sender adopts 2.4GHz band to achieve super high speed signal transmission for smooth and fast internet. The device adopts the internationally accepted open 2.4GHz band, with anti-interference ability, the image clear and stable. Can transmit 2-channel stereo audio signals and video signals. Video signal format: PAL / NTSC. Features:This 2.4 GHz Wireless Remote Red Laser Pointer Presentation Black is small and exquisite, portable and with richer applications. An essential nice assistant of demonstrations or presentations, you can easily point to the PPT or blackboard in any corner of classroom. Making your demonstrations or presentation seem more dynamic and making listeners feel release. This laser pointer is also the best gift for friends and familiesPower saving, lightweight, suitable for putting in your pocket or handbagsDescription:This high quality laser pointer adopts the latest technology red laser optics and microelectronics.Supports MS Word, Excel, PowerPoint, ACD See, website, iWork (Keynote & Numbers & Pages) for Google Slides.Specifications:Model: F1Frequency: 2.4 . Place pour DVD, DVR, CCTV caméra, IPTV, démodulateur, TV numérique définie settop box, etc. Type: sans fil. Caractéristiques : Sans fil, Installation facile, Portable, universel. MPN Does Not Apply. EAN Does not apply. Fil ou sans fil : Sans fil. Matériel de Shell: Plastique. Ligne de guidage : Oui. Type d'ouvrage: Abs. Interface: RCA (AV). Technologie sans fil brevetee - pour reduire les interferences causees par d'autres peripheriques sans fil. Entree / sortie AV: RCA. Type: sans fil. 2 x cables AV. Sensibilite: -90 dBm. Ricevitore che consente di captare il segnale audio e video sulle 4 frequenze (2,413-2,432 -2.451- 2.470GHz). Uscita video: 1 Vpp / 75 ohm, uscita audio 2Vpp max. EAN Does not apply Channel 8 Frequency 2.4GHz Certification CE Product Model AR800 Material Plastic Color Black Brand Unbranded/Generic MPN Does not apply Marque - Sans marque/Générique - Numéro de pièce fabricant Non applicable EAN Non applicable. Résolution HDMI 480P / 720P / 1080P-50Hz / 60Hz ; HDMI Format audio LPCM2.0 / 48KHz / 16Bit ; Bande passante HDMI max. Puissance de sortie de transmission 14 /- 2dBm (IPEX Distance de transmission jusqu’à 60 m (en espace ouvert) IR Fréquence porteuse 20-60KHz Spécifications de l’adaptateur secteur CA 100 ~ 240V / USB 5V / 1A ; Courant de travail TX maximal inférieur à égal 750mA / RX inférieur à 550mA. ). Wire or Wireless: Wireless. Length of Video Cable: 2M. Guiding Line: Yes. De bien vouloir nous laisser une rétroaction positive et nous donner l'estimation détaillée de vendeur avec les «5 étoiles» dans la zone très. Votre reconnaissance nous encourage beaucoup et mieux vous servir. We will help you to solve the problem. 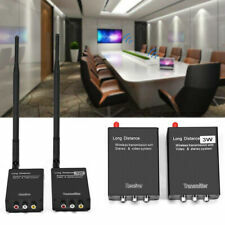 [HD Audio Video Transmit] : Shadowplay SP2 is a real 1080p full HD wireless transmitter & receiver kit, which can stream uncompressed HD video and clear audio(TV shows, films, music) from DVR DVD STB(Set-Top-Box) IPTV to TVs or other display screens with low-latency. Le 11-déc. -18 à 11:34:07 Paris, le vendeur a ajouté les informations suivantes Votre reconnaissance nous encourage beaucoup et mieux vous servir. de bien vouloir nous laisser une rétroaction positive et nous donner l'estimation détaillée de vendeur avec les «5 étoiles» dans la zone très. Features:Supports 802.11ac standard.Compatible with 802.11b / g / n wireless devices.Transmission rate, 2.4GHZ/300Mbps, 5GHZ/866Mbps.Supports WPA / WPA2 / WEP / 802.1X / WMM encryption.Operation system: for Windows ME/98SE/2000/XP/Vista; for Linux; for MAC, for Windows7/ 8.X/10.Strong anti-interference ability.Descriptions:Dual-band wireless WiFi standard technology adapter, can simultaneously be worked in 2.4G and 5G band. 5GHz channel with low interference and exc. Puissance de 100 mW à 4 canaux commutables. - Portée audio-vidéo est de plus de 200 à 300 mètres sans obstacles ni interférences. - 2 Cordons RCA Mâles fournis. - Connections RCA Mâle pour l'audio et vidéo. Sostituire (at) con @. Skype: ciabapa. Features:Wireless remote control presenter, operating on 2.4GHz RF frequency, laser up to 200 meters wireless range, so you can free to move around the room and interact with your audience.The laser pointer of this presentation pen that's easy to see against most backgrounds, highlight key areas of your slides.Powered by 1* AAA Battery (NOT included), swift and easy to change the laser pointer.Auto standby and deep sleep functions for energy-saving and durable use.Portable and convenient. With USB receiver for easy pack up and portability.Description:USB receiver dongle supports Plug and Play, No driver is required.Basicly page up /page down /play slides /black screen for PowerPoint presentation and keynote, can support website browser/ picture software . Features: Stronger anti-interference,Further distances Extra Satellite is not needed,more convenient. 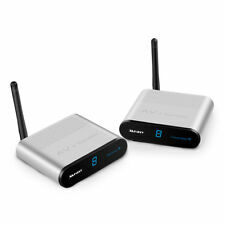 AR8000 DSMX 2.4 GHz 8 Channel Receiver is a high quality aftermarket parts. Specification: Color: Black Material: Plastic Voltage: 3.5V-9.6V Channel: 8 Modulation: DSMX Frequency : 2.4GHz Product Model: AR8000 FCC: BRWDASRX10 Size: 15 x 8.5 x 6 mm Package Includes:. Bitte lesen Sie vor dem Kauf des Artikels "Motorola MBP36S MBP 36S 2.4 GHz Video Babyphone" die vollständige Artikelbeschreibung durch, um mehr über Zustand & Lieferumfang zu erfahren und um Fehlkäufe zu vermeiden!. FOR SALE IS A TRANWO SMART WIRELESS VIDEO. 2.4 GHZ WIRELESS AUDIO / VIDEO SENDER. Transmits sounds and pictures from any of your existing A/V components to your second TV wirelessly. IR relay function allows you to use remote handset to operate presentation A/V components in other room in the house. Model VR36A. Country/Region of Manufacture China. Connectivity See Details. Transmission Frequency 2.4GHz. Custom Bundle No. UPC Does not apply. Infra-Red Extender No. WELLTECH 2.4GHz Wireless Audio Video TV AV Sender Transmitter Receiver. Condition is Use. Work perfect.Dispatched with eBay delivery – Shutl 2-3 days. WIRELESS A/V SYSTEM, 2.4 GHz. USER'S MANUAL. Model VT46A. Transmission Frequency 2.4GHz. Output Connection see details. Connectivity Wireless. Country/Region of Manufacture China. UPC Does not apply. Model VR30A. Connectivity See Details. Transmission Frequency 2.4GHz. Country/Region of Manufacture China. UPC Does not apply. FOR SALE IS A TRANWO SMART WIRELESS VIDEO, GIGA AIR 2424. 2.4 GHZ WIRELESS AUDIO / VIDEO SENDER. Transmits sounds and pictures from any of your existing A/V components to your second TV wirelessly. IR relay function allows you to use remote handset to operate presentation A/V components in other room in the house. Transmission distance:up to 200m (in open space). Using an external dual - gain antennas. The extender follows the TCP / IP standard Wireless Transport Protocol, so it has high transmission rate and strong anti-interference capability. Arfatech AV Profi Funkübertrager Sender. Arfatech Wireless AV Transmitter. StandardSMA Antennen-Schraubbuchse erlaubt Anschluss externer Antennen für Reichweitengewinn. Je nachdem, wie der von Ihnen verwendete AV Receiver harmoniert, können diese Werte besser oder schlechter ausfallen. • 2,4-GHz-Übertragung. 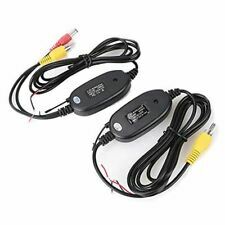 2x Netzteil (Micro USB, 5 V (DC)/1 A). Wenn eine kabelgebundene Verbindung nicht möglich ist, kein langes HDMI-Kabel zur Verfügung steht oder Sie einfach keine langen Kabel durch das Haus verlegen möchten, ist diese kabellose Lösung ideal.